A fabulous mature Japanese White Beech [Fagus crenata] hardy outdoor informal upright style bonsai tree for sale in beautiful teal blossom ceramic bonsai pot. A substantial elegant 30 year old bonsai with phenomenal taper and wonderful nebari with exposed roots. The pot is a stunning addition with colourful etchings and paintings. An unusual vareity of bonsai; making it more special as they are not easy to come by. 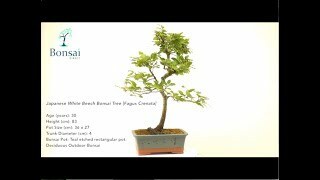 A very easy bonsai vareity to care for making it an ideal feature in any garden, patio or on the decking by a pool. You can choose the delivery date at the checkout and delivery is FREE to most areas of the UK. We also ship to most regions of Europe. For more information please see the videi below the main image. This bonsai has the makings of something truly spectacular. It is a very mature 30 year old tree which simply requires a little refinement of the branches to make it exceptional.